Where Did These Idiots Come From? The best professional online commentator on all things “Nats Baseball” is Dan “MASN Dan” Kolko. You will find him on the MASN website. 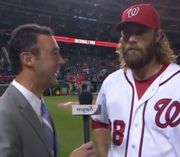 If you have watched even two innings of Nats baseball this year on MASN TV, you have seen Dan. He is not quite as good-looking as his eye-candy predecessor (Christina __________), but he knows baseball and he is VERY GOOD at his job. If the Nats are playing on the West Coast (SF for example:), I go to Dan’s game summary first when I wake up in the morning here on the Eastern Seaboard to see what happened while I was sound asleep. Dan really doesn’t have much competition however; roughly 90% of the online people who write about the sport are………., well, IDIOTS. I don’t much like that term, but in this case it fits. But if you ever take a glance at the public commentary on the usual baseball websites (like the official Nats team one) one can quickly see that maybe the inmates have taken over! Just for laughs a couple of months ago, I spent a week posting comments on one such website. After keeping track of the number of individuals posting there who appeared to have a minimal understanding of what baseball is all about I ended up with the following: 3 out of the 87 fit that description! There is a chance I could be just a bit biased, having grown up with a transistor radio tuned to Vin Scully bringing me the Brooklyn Dodgers:) The price of gas, by the way, was twenty seven cents per gallon when Vinny began his career.